Biryani, the word itself makes my stomach growl and my mouth water. I just cannot resist Biryani; it is something I have been in love with since time immemorial. Be it to celebrate some happy moments or to pep myself up during low times, I have always reached to a plate of Biryani. I feel, if there is such a thing as foods of the God, it is undoubtedly the Biryani. Just not me, millions of other people throughout the world will agree with me on this. Though I love the Kolkata style Biryani (Click HERE for recipe) the most, but I don’t mind trying out different varieties of it. 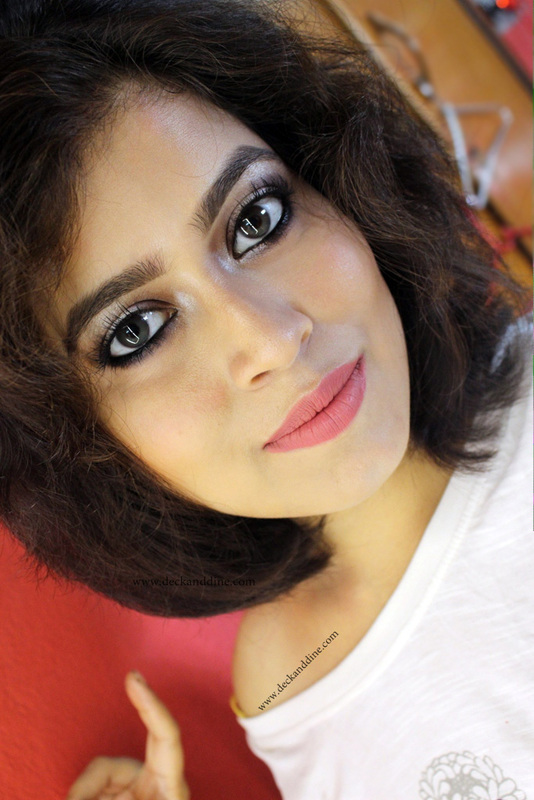 Today’s post is on one of such recipes, Yakhni Biryani. Inspired from Kashmiri cuisine, this Ramadan special dish is very simple to make, but is an extremely aromatic and rich in flavours. 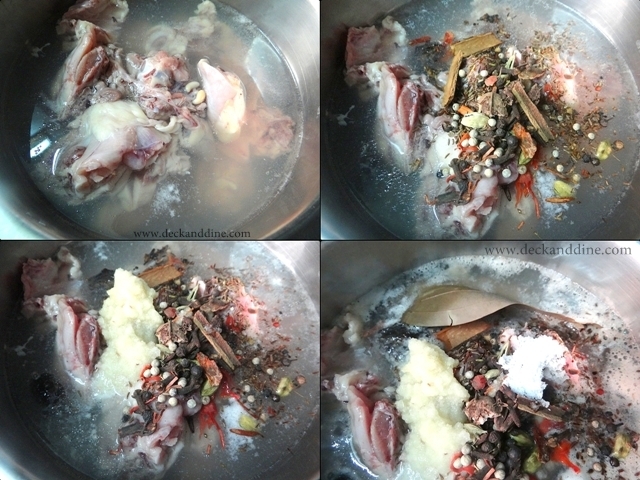 Yakhni is the meat stock in which the rice will be cooked, so it gets all the lovely flavour from the stock. 700 gms Chicken, cut into medium pieces and washed properly. Pour water in a deep bottomed vessel and dunk in the chicken pieces. Add the cloves, cinnamon, mace floret, nutmeg, black peppercorns, bayleaf, black cardamoim, shahi jeera, shahi mirch to the water. Add half of ginger-garlic paste. Now cook the meat in medium-high flame. When the chickens is half cooked, turn off the flame and let it sit for 10 minutes. Take out the chicken pieces and strain the chicken broth. This chicken broth is called the Yakhni. Now take a pan, add oil and fry onion julienne for barista. Take out and keep aside. In the same oil, add bay leaf and rest of the sliced onions. Fry till it becomes golden brown. 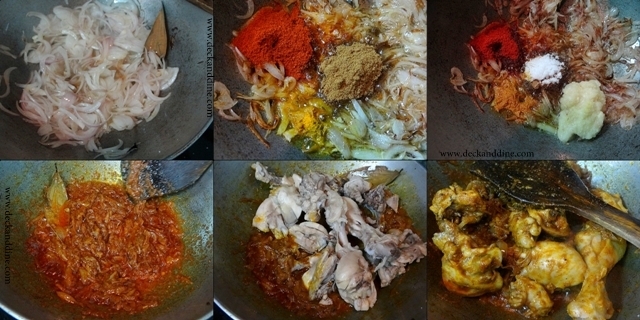 Add turmeric powder, chili powder, jeera powder, sugar, salt and the remaining ginger-garlic paste. Dunk in the chicken pieces and cook for 2 minutes. Now take the yakhni in a deep bottomed vessel and place it on low flame. 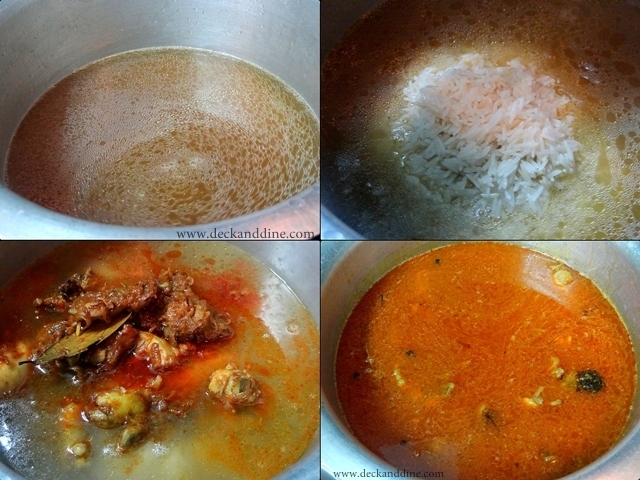 Cook on medium-high heat till the yakhni dries up and the rice becomes soft. Add ghee and saffron infused milk just before turning off the flame. Mix well. Top it with onion barista and serve hot with raita. Bookmarking it... Will prepare this Sunday.. I love chicken biriyani.. Thank you for sharing this yummy recipe..